Since I began my midlife crisis running career, I have only raced twice in what I would call the North. In 2012 I ran the Great North Run and in 2016 I competed in the Helvellyn Triathlon which involved a run to the top of Helvellyn and back down again. I really should make an effort to do more races north of Birmingham because there’s so much good running there, from the Lake District to Northumberland, the Yorkshire Dales and the Pennines. And that’s without even starting on Scotland. So it was that in September 2017, my running buddy Richard and I travelled to take part in the Hardmoors 60. The Hardmoors series is a well known and well respected series of races through the North Yorkshire Moors and along the Cleveland Way. 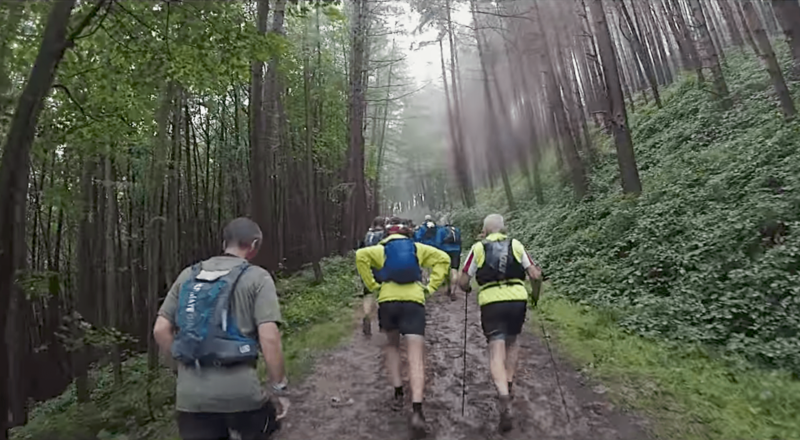 From 30 miles right up to a 200 mile single stage race, there’s an ultra for everyone. We were going to run the relatively modest Hardmoors 60, which in reality is about 62-63 miles or 100km. Our adventure to the north didn’t start particularly well. Both Richard and I hadn’t realised that having a proper OS style map of the Cleveland Way was part of the mandatory kit list. We thought a printed map from a website would be fine. It was too late to order a map online and so our only option, we thought, was to buy them in person at a shop called Let’s Run in Middlesbrough. This meant leaving the south coast in enough time to get up there before the shop closed. Unfortunately we had a terrible journey dogged by endless traffic jams and road works. We eventually realised we weren’t going to make it and as a last resort we phoned the shop. Thankfully the folks at Let’s Run said they could bring the maps along to the start of the race in the morning. That was a weight off until we realised that Richard hadn’t brought a survival bag. Also on the mandatory kit list, Richard had assumed it meant Space Blanket, which is more normal for this kind of race. We found a Mountain Warehouse store just off the M1 north of Nottingham and they saved the day. Let this be a warning to you all. 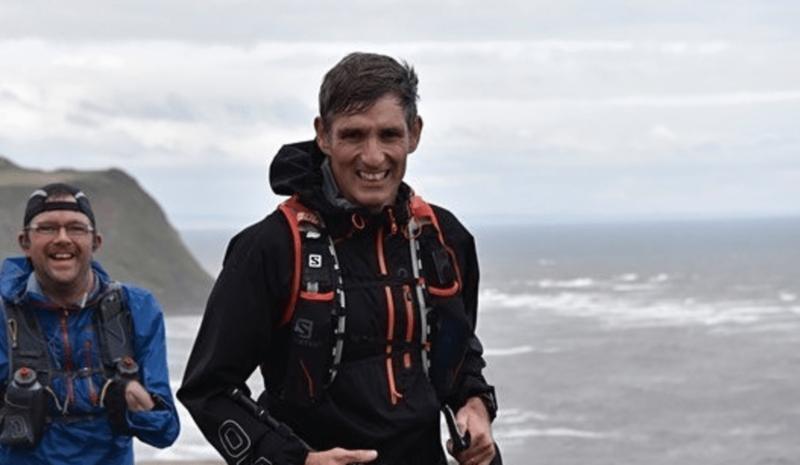 It doesn’t matter how experienced you are, and Richard and I have done a good few ultras and trail marathons now, you still need to read the mandatory kit list thoroughly. Check and recheck your kit to make sure you have everything you need. You don’t want to have travelled miles and spent a ton of money on race entry, petrol, train and airfares only to be told you can’t race because you don’t have a rainproof jacket. That was not the end of our fateful journey though, oh no. Half way up the M1 we received a phone call from the Filey Brigg Caravan Site to tell us that the site was flooded and we should consider cancelling and finding alternative accommodation! Unbelievable. Still, we thought, how bad can it possibly be? We don’t mind a bit of mud. Surely there’ll be a tiny patch of grass for us to pitch our tent. We carried on in this positive frame of mind. Ultra runners are rarely defeated by minor problems like a lack of suitable pre-race accommodation. If the worst came to the worst we would sleep in the car. When we did finally arrive in Filey we really couldn’t understand what all the fuss had been about. The ground was perfectly acceptable. The place where we pitched the tent was hardly wet at all. We found the Methodist Church Hall where we would hopefully finish the race the next day and had a fish and chip supper at a local eatery before heading to bed in our dry, warm tent and sleeping bags. Then it started to rain. Hard. It rained so hard and the wind was so strong it blew the water with force through the tent lining. We were literally splashed with rain as we were lying inside the tent. We were so tired from the journey we still managed to sleep. Bring on the Hardmoors 60 in the morning. It was dark when we went to bed and it was dark when we woke. Race start wasn’t till 9am but we had a long coach journey first, which required us to stand, waiting in a car park in the rain at 6:30am. It was still raining when we arrived in the small town of Guisborough just south of Middlesbrough. We were asked to be quiet walking from the drop off point to the race HQ as the residents have complained in the past about the noise. Honestly, a few people walk past your door chatting at 8:30am on a Saturday morning and people are up in arms. Oh well. Race HQ was too small. There were simply far too many runners to fit inside the Guisborough Sea Cadets hall. We managed to squeeze through to collect our maps and race numbers. We attentively listened to the race briefing and then stood for 10 minutes waiting to exit the hall. Bizarrely, once we did get out, the race had already started! Not sure why it couldn’t have waited until everyone was out on the street and ready. Still, it’s not a big deal I guess. We ran up Belmangate in the pouring rain and under a railway bridge, which is where the race has started in previous years. Belmangate eventually becomes a dirt track. On this occasion, when we got there, it was almost completely blocked by an irate delivery driver and his truck. 200 runners trying to squeeze past a DHL van, which was at the same time attempting a three-point turn on a dirt road in the rain. Had I mentioned that it was raining? Well, it was. Richard and I had negotiated an arduous journey up from the south coast, we had survived a tawdry night in a tent and missed the start of the race. Over the next two miles, things did not improve. A little way further up the trail we came to a style. Unfortunately, the pack had not had time to thin out, so we all came to a stop for five minutes whilst one person at a time carefully negotiated the style. At least the rain had stopped, but now, within the first 2 miles of this 62 mile run, came the longest, steepest climb of the race. Now the thing is. I don’t mind climbing. It’s tough but I enjoy it. And part of the reason I enjoy it, is the reward at the end. When you climb a hill, there is usually a stunning view over the landscape for miles. 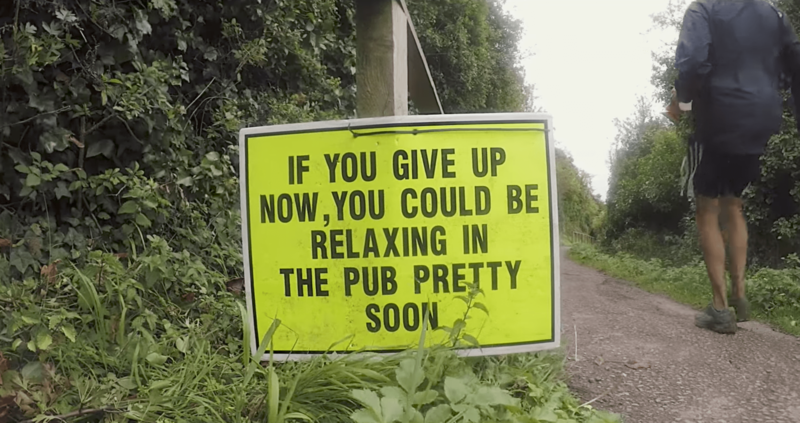 Whether it’s on the South Downs, in the Lake District or the Alps. The Hardmoors 60 should have been no different. The North Yorkshire Moors are beautiful and when you climb up to Highcliffe Nab you would normally be greeted by a fantastic view. Not, however, on this occasion. Visibility was about 20 metres. We slipped and clambered the final few metres up the hillside to be greeted by a summit shrouded in thick low cloud. We couldn’t see a thing. So let’s just recap again, shall we? A tiresome journey up from the south coast involving traffic jams, panicking about mandatory kit, stopping to buy mandatory kit, worrying that we might have to find alternative accommodation because the campsite was flooded, enduring a broken night’s sleep as the tent was assaulted on every side by wind and rain, much of which found it’s way through the tent onto our faces, standing in the rain, in the dark, at 6:30am and still missing the start of the race due to being stuck in an overcrowded, tiny hall in Guisborough. Then starting the run only to be stopped in our tracks by a DHL van blocking the path, waiting ages for 200 people to clear a style one by one and finally climbing the most enormous hill of the entire race hoping for a stunning view at the top, only to be greeted by a bank of fog thicker than Donald Trump. Things had not gone well so far, and we had only run 2 miles. I jest of course and thankfully, from here on in, my experience of the Hardmoors 60 would get decidedly better! 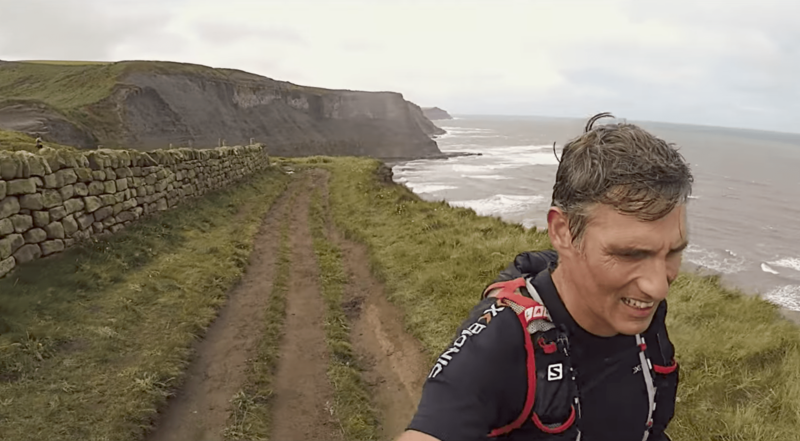 The route had begun inland and the first 10 miles was spent running towards Saltburn and the sea, to join the Cleveland Way. Apart from that first monumental climb, it is a relatively flat and sedate start. It was pretty running through the woods, along the river and under the impressive Saltburn Viaduct. Things got rather more tasty when we reached the coast. There’s a climb out of Saltburn onto the cliffs and there was a really strong wind once we reached the top. It’s beautiful running with impressive cliffs stretching out ahead. We ran alongside the railway briefly and past Richard Farrington’s Charm Bracelet sculpture. We were on the beach just before Skinningrove and passed through the pretty village of Staithes before arriving at the first drop bag aid station at Runswick Bay. There were two drop bag points at 20 and 40 miles approximately. I wasn’t able to stay too long though as the marshals were telling us to get down to the beach quickly before the tide came in and they had to start sending runners off on the longer route around the bay. I grabbed my bottle of Huel and made my way down. The water was already just a few metres from the base of the cliff so I was amongst the last few runners to make it across. It didn’t seem like a long journey to Sandsend which is the start of the built up area into Whitby. I remembered reading a blog post about a runner in a previous Hardmoors 60, who talked about having to run through a busy street with hundreds of tourists getting in his way! At the time I thought, where could that possibly be? What town on the Yorkshire coast could possibly be packed with tourists in mid September? Well, I certainly didn’t count on Whitby being quite so popular. It was absolutely heaving. The thing is, as trail and ultra runners, we have to respect that the places we run are not for our exclusive use. We share the trails, paths and roads with everyone else. We can’t go getting angry with people when we are trying to run through a crowded town centre. I took my time and made my way through the crowds climbing up to Whitby Abbey and on, to the half way checkpoint. By now, not only had the rain stopped but the goddam sun had made a reluctant appearance. It was warm enough for me to remove my jacket and I didn’t put it back on for the rest of the race. By the time I reached Robin Hood’s Bay I was beginning to feel tired. The ground underfoot was also becoming quite slippery, even for the aggressive lugs on my Hoka Speedgoats. However, the evening sun was beautiful. 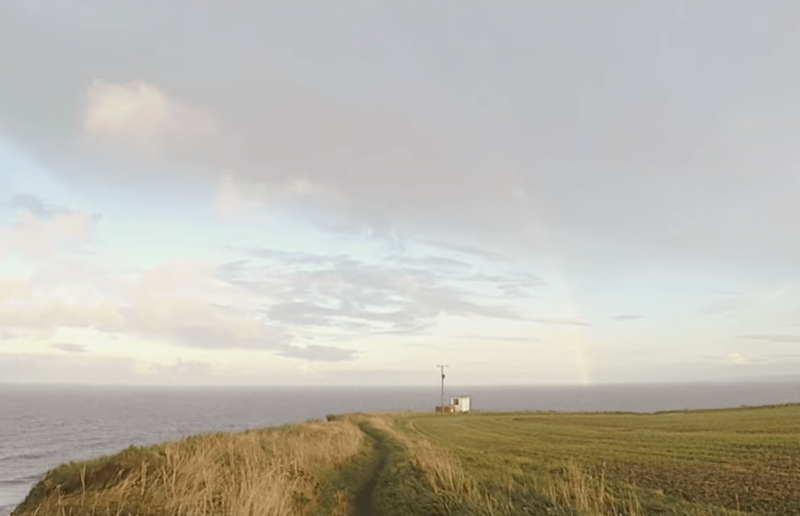 There was even a rainbow at one point and that carried me through to the second drop bag aid station at Ravenscar. This stop is slightly inland and there was a huge climb up Cragg Hill to get to it. I stopped for coffee but I didn’t consume any of the goodies on offer. There was masses of stuff to eat. Pizza, cake, sandwiches, all manner of delights designed to keep runners from running and rather ensuring they sit for hours getting bloated and DNF due to over-comfort! I got on my way. Getting back to the coast path involved a long straight run down Bent Rigg Lane. I then had to negotiate a field of cows occupying the exact route I needed to run to get back on the coast path. I don’t like cows at the best of times but I had to man up as there simply wasn’t an option. So I just walked straight towards and through the middle of the herd. They parted for me, eyeing me all the way until I reached the style. As I climbed over I saw two other runners catching up. This spurred me on somewhat and I made good time over the next ten miles to Scarborough. I dropped down into Scarborough’s North Bay just as the light was fading and ran towards Scarborough Castle at the opposite end of the bay. I don’t think I’ve ever been asked what I’m doing by so many people. “How far are you running?”, “60 miles from Guisborough to Filey”, I’d say. “What…..in a day?!!! !” was the reply on more than one occasion! By the time I rounded the headland at Scarborough Castle, I was done in and decided to walk for a bit. The main seafront at Scarborough was bustling with nightlife and the neon signs were in full force over the arcades and hotels. I got to the other side of the town with a run/walk strategy and then donned my head torch. One of the guys I had been trying to keep ahead of managed to catch me up and left the final aid station before me. This was partly because I had stopped to film, but to be fair he was running very well and managed to catch a few more runners over the final 8 miles. I was completely done in now and that final few miles took forever in the dark. Because I was so tired I was finding the ground very difficult underfoot. I was slipping and sliding all over the place and there was a lot of walking. With 6 miles to go there was a final mini checkpoint on Osgodby Hill, lit up nicely with fairy lights directing us into the woods. I was spooked at one point when some young lads hid in the long grass on a climb and jumped out at me as I approached. I was ok with them about it but apparently one of the runners before me had had a right go at them. I found it such hard going in those last few miles and the lights of Filey weren’t getting any closer it seemed. Finally, I passed the Filey Brigg Caravan Site and dropped down into the town. There is one final climb up from the seafront on the road to the church hall, which I had planned on running, but did eventually just walk. I finished in Filey Methodist Church hall having covered 101km in 14 hours 15 minutes. I was 50th. Richard had finished 2 hours ahead of me in 12th place, which is a great result. I sat for a long time getting myself back together before Richard arrived and we went off to find food. He had already eaten a pizza whilst waiting for me to finish! Thankfully our second night in the tent was rather more subdued than the previous night. There was no wind, no rain and after consuming what had become cold burger and chips, I slept well. Despite the hilarious beginning to our adventure and the desperately tiring last few miles, I have to say that running the Hardmoors 60 was fabulous. It was so nice to run in a different part of the UK to my usual running haunts and the course kept me interested all the way. 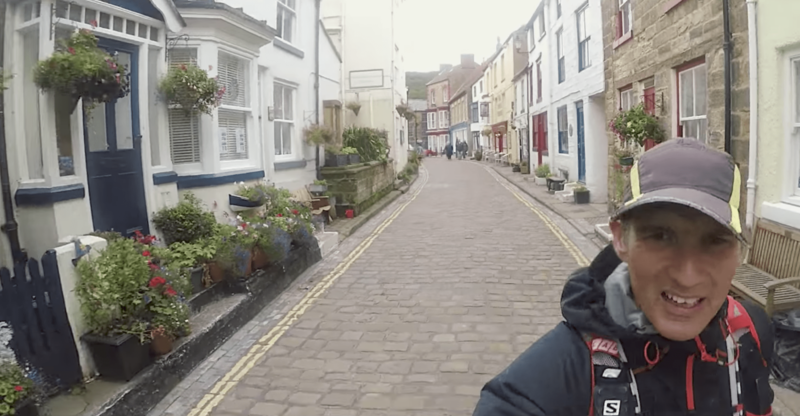 From the bustling towns of Whitby and Scarborough to the wild and rugged coastline, the pretty fishing villages and the impressive forests, it was all superb. The aid stations were all well stocked. The staff and volunteers were splendid and a big thank you to them, especially those at the top of Highcliffe Nab! It certainly makes me want to have a go at the 110. If you would like to explore the North York Moors or the Cleveland Way, there really isn’t a better way to do it than by entering one of the Hardmoors series races.